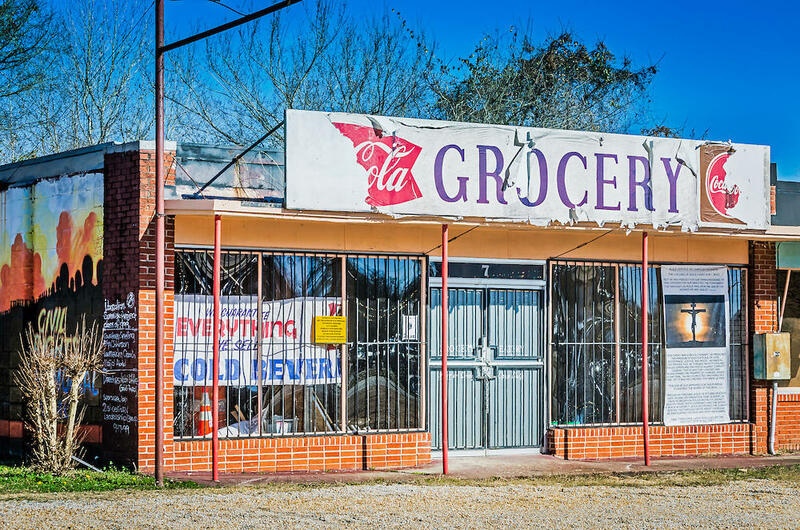 Abandoned grocery store in Selma, Ala.
Close to two million Alabamians currently live in areas with no grocery stores or access to fresh produce. That’s something the state government hopes to change. This year, the Alabama state legislature passed the Healthy Food Financing Act, aimed at providing incentives for grocers to open stores in underserved areas of the state. But the legislation doesn't currently include any funding for the program. Ellie Taylor is the president of the Alabama Grocers Association. She says it was important to get the framework in place first, and then find funding. The grants will be managed through the Alabama Department of Economic and Community Affairs. A federal judge in New Orleans is hearing arguments over a case involving building materials made in China. APR’s Pat Duggins reports Alabama homeowners are part of the lawsuit. U.S. District Judge Eldon Fallon is weighing evidence against the Taishan Gypsum Company. The current issue is whether Taishan tried to hide information relevant to the case. Specifically, whether the Chinese company tried to hide the location of its former head of sales. Attorneys for the plaintiffs say they were told that manager Pong Wenlong had left Taishan and no one knew his whereabouts. There’s reportedly evidence that Wenlong continued to work for the wife of the company’s owner. Wenlong’s computer also supposedly has files that could have prevented a lengthy legal dispute over whether U.S. courts had jurisdiction in the matter. Plantiffs in the case claim they bought defective drywall from Taishan that gave off sulfur fumes which made homeowners sick and corroded metal parts and appliances. The U.S. Army Corps of Engineers has once again suspended unescorted public access to locks on the Tennessee River. The Times Daily reports the Corps of Engineers released a statement yesterday saying no specific threat had been made against locks on the river, but terrorist activity in general has increased in the U.S. and overseas. It's not clear when the Corps of Engineers will restore public access to the locks. Nashville District Commander Lt. Col. Stephen F. Murphy says the Corps of Engineers and Tennessee Valley Authority will perform a "precautionary" review of their security and public access policies. The locks were in the process of reopening to the public after being closed in the wake of the September 11, 2001 terrorist attacks. Wilson Lock was reopened in May of last year; Wheeler and Pickwick Locks had not yet reopened to the public. Auburn’s city council has extended a moratorium on the construction of some new apartment complexes near Auburn University. The Opelika-Auburn News reports the Auburn City Council voted unanimously to extend the measure. The six-month moratorium had just expired; it now stretches until May of next year. The moratorium prohibits any new construction of purpose-built student housing in Auburn, classified as private dormitories. The newspaper reports the moratorium on new apartments has created supporters both for and against the idea. Some fear that more large-scale student housing complexes threaten Auburn's small-town charm. Others think stifling development would be detrimental to attracting investors and the collection of tax revenue. The moratorium is expected to last until the city of Auburn approves a new zoning ordinance. That’s expected to take place in late spring. Alabama Public Radio's morning newscast for December 16, 2015.